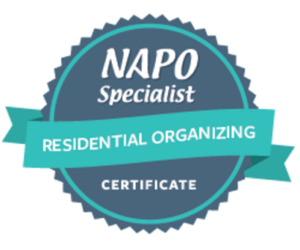 My name is Pat DePalma and I am a Professional Organizer, Productivity Specialist, and the owner of Organized For Life, Wilmington, Delaware. Since you're here, you're probably considering making some changes to improve the quality of your life or your work - congratulations, you've taken the first step! I hope my website will answer any questions you have, but if not, please call (844-ORG-4LIFE) or send me an email using the Contact Us page. It's important to me that you have all the information you need to make an informed decision about your next steps. I started Organized For Life in late 2014, after a long career in Information Technology and related disciplines. I was ready for a change, decided to go big, and made the leap to entrepreneurship. 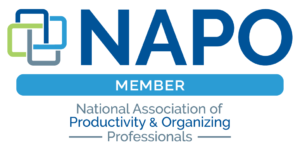 After completing the curriculum required to become a professional member of the National Association of Productivity and Organizing Professionals (NAPO), I embarked upon a new career in Professional Organizing and have never looked back! 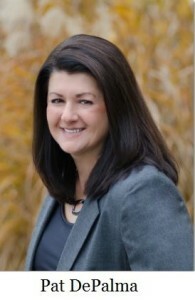 As a "born organizer" with 30+ years of professional problem solving experience, it is my privilege to now put my skills to work for business owners and individuals who want to simplify their business or their life. I can help you implement better, more efficient ways of doing things, bring order out of chaos, and free up your space and time to make room for more enjoyment in your life. I have been working with computers since before people had them in their homes, let alone in their pockets, so if you're struggling with electronic processing or records management, or thinking about converting from paper to digital, I can help. I have relocated seven times, setting up organized living spaces and systems in new and different environments, raised two active children, and helped family, friends and clients with organizing challenges; so if you're overwhemed with too much paper, too much stuff, or too little time, I can help. I have a BS in Information and Communication Science from Lehigh University. Over the course of my career, I have held a variety of positions in both major corporations and a small consulting company: systems analyst/programmer designing, building, testing, implementing and providing training for custom software solutions; systems manager overseeing the operations of minicomputer installations; technical writer developing documentation, procedures and manuals; business analyst determining user requirements for systems to support the business; QA analyst testing software functionality; content analyst managing content storage, retrieval and retention in enterprise content management systems; and process engineer examining business process flows, looking for ways to improve the accuracy and efficiency of those processes. * If you're interested in more detailed information about my professional background, you can find it on my LinkedIn profile. I firmly believe that, with some coaching and solutions tailored specifically for you, anyone who wants to can get - and stay - organized. And when you're organized, life is simpler and you have more time for the things you want to do. When you're ready to simplify your business or your life, call Organized For Life! 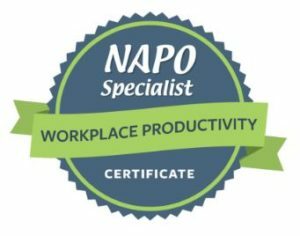 I am a Certified Specialist in both Workplace Productivity and Residential Organizing, and a member of the National Association of Productivity and Organizing Professionals (NAPO), the Delaware State Chamber of Commerce, and the Delaware Small Business Chamber. 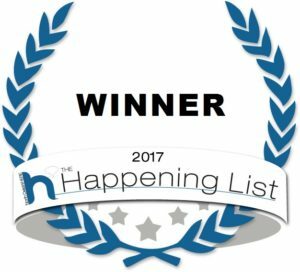 I am also honored to have been voted North Delaware's 2017 "Most Happening" business in the category of Organization and Personal Assistance. As a Professional Member of NAPO, I adhere to NAPO’s code of ethics.